So I know this super late, but that's still better than never, right? Let me start by saying that this was by far my best Kruger trip to date. We organised it way back in May! My Dad absolutely loves wildlife but barely travels by plane (I think I was still dating Varen the last time he came to Joburg to visit me!). So I told my folks, knowing about our intentions to start trying for a baby this year that we wanted to get all the awesome things about living in Joburg done (again in some cases) before we headed back to Cape Town, so this was their opportunity to finally come to the Kruger Park (neither has ever been. Shocking for 2 people who love wildlife and have lived in South African their whole lives, right?). I didn't think Dad would actually come and I invited Mom along too. I spose it's a bit weird to invite your two divorced parents on holiday with you, but that's not the sort of divorce they have (thankfully!). And Dad's girlfriend and her daughter were invited along too (of course). As the planning actually kicked in and it turned out we couldn't get accommodation when we'd planned, the trip got pushed out to November. After our last trip there, The Trucker and I specifically wanted to stick to the Southern camps: Crocodile Bridge and Lower Sabie. Dad's girlf and her daughter couldn't make it (exams and leave) but both my folks were still keen. We were fine with it if they were ... it saved us having to get a 2nd car for the trip. But it did turn out to be kinda entertaining checking in with 4 people for 3 rooms (which slept 2-3 people each). My folks flew up on the Friday (7 November) afternoon and as soon as I got home from work we all headed to Kaapsehoop for our overnight stop. The week before they arrived was a little stressful: my mom ended up in the Emergency Room on the Wednesday night / Thursday morning, luckily her doctors cleared her for the trip. Plus the Pajero we had been planning on using was no longer in working order ... so we had to hunt down a rental car. I'm thrilled that because of the 94.7 Mountain Bike race happening that weekend that we actually couldn't rent the car in Joburg. It meant we came up with a different, cheaper plan. We took my Jazz all the way to Nelspruit and rented the X-Trail from there. So we headed to my Mom's cousin in Kaapsehoop for Friday night (my folks met thru him, back in the day, because he was my Dad's housemate). We had a lovely dinner at The Bohemian Groove Cafe (seriously, my meal, the Pork Schnitzel, although it took ages, was amazing!) and then stayed in a cute little cottage. The place was crazy misty. From there it was on to Nelspruit, a quick Wimpy Breakfast and off to the airport to collect the car. With that done we headed into Kruger at the Phabeni Gate. Our days at Kruger from then are a blur ... we spent 2 nights in the chalets at Crocodile Bridge and 2 nights in the tents at Lower Sabie (disappointingly the tents furthest from the river). One of the days the car said the temperature got all the way up to 42! And then we had some overcast days towards the end (luckily the weather turned after we checked into the tents ... we were a little nervous of surviving the heat in them!). We had an incredible animal viewing experience. On 2 days we managed to see the full Big Five before lunchtime! 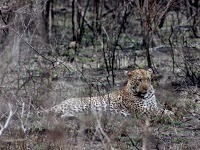 And this from 2 people who had never seen a Leopard in real life before! Seriously. 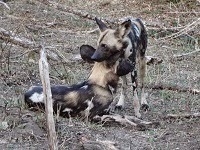 We saw a pack of Wild Dogs lazing on the side of the road. 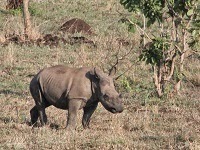 We saw over 40 Rhino during our trip (inl 2 babies). We saw Leopards mating at dusk. Okay so the light was terrible and we could only see them thru the binocs (Definitely have to buy ourselves a pair, having Dad's pair in the car was a huge bonus!). 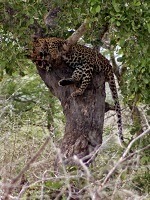 On morning The Trucker spotted a Leopard dozing in a tree! And then we saw one briefly with it's kill. I saw more Hippos out of the water than ever before (I don't actually think I've seen a wild one out of water). We saw Lion ... only one male, but a cub experience that was incredible! 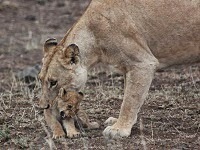 There were 2 momma Lions with an array of 5 cubs in various ages. There were two littlees who were so cute bounding around! We saw loads of Ellies and generally loads of baby animals everywhere. We saw a stand off between a croc and a cautious dik-dik (no one got eaten). And we saw the usual: Buffalo, a Hyena, Jackals, Giraffes, Zebras, even a puff adder that had recently eaten. And so many birds! The food in the park was better than our last trip. They've converted the old awful restaurants to Mugg & Beans and Cattle Barons. And their shops were all well stocked. Mostly we braaied ... although we did have one Mugg & Bean dinner.